We had a few sweaters this season that seemed to catch everyone’s eye. Cardamom was definitely one of them. 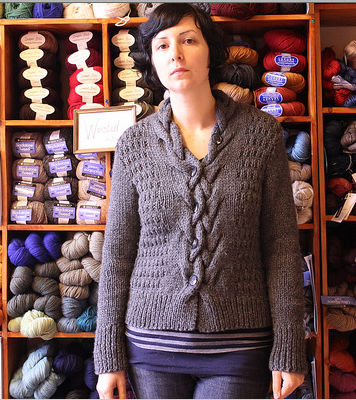 Knit in the super bulky Berroco Peruvia Quick, it goes without saying that this cardigan doesn’t take long to make. It’s also cozy and has great texture, combining stockinette stitches, ribbing and a clever cabled button band. Raveler Whatthehay knew she wanted to get it on her needles even before most people had seen a picture of the design. Lucky for her, she’s a local yarn shop owner. So she got a head start making a sample for her store – a sample that she likes to model herself! Here’s what she had to say about the project. Why did you make this pattern? Officially, it is a shop sample. Unofficially, it’s in my favourite colour and in my size, sooo… it will eventually be mine. And if it’s cold in the shop and I’m somehow underdressed, I take it down from the hanger and wear it for the day. It’s still a sample if I’m wearing it in the shop, right? Exactly! Any interesting stories about your process? Because I first saw this cardigan in a booklet preview, before the booklet was even available, I thought I wouldn’t be able to start it for a while. But I sent a quick email to my rep at Berroco (Kris, she’s the best!) to inquire about it, and she sent me an advance, text-only copy of the pattern so I could get started on it right away. Now, I am not a person who does mystery KAL’s or anything, I really like to have a photo to work from and compare to. So this was really my first time knitting “blind”, just following the instructions, but it worked out fine! What do you think of the finished sweater? I love this sweater. It’s pretty and simple and easy to wear. I tend to be a person who always feels cold in the winter, so having a big, cozy sweater like this around is really useful. Have you recently finished a Berroco pattern you want to share? You can email Ashley: apalumbo@berroco.com or post it to the Berroco Lovers forum on Ravelry. I love this design and have had it queued on Ravelry for ages but there are no suppliers for the pattern in Australia… must get organized and order it online! It’s such a lovely FO too.